President Barack Obama received ten thousand letters a day from his constituents. This is the story of the private and profound relationship with letter writers that shaped his presidency. Their voices combine to reveal a diary of a nation. Every evening for eight years, at his request, President Obama was given ten handpicked letters written by ordinary American citizens—the unfiltered voice of a nation—from his Office of Presidential Correspondence. He was the first president to interact daily with constituent mail and to archive it in its entirety. The letters affected not only the president and his policies but also the deeply committed people who were tasked with opening and reading the millions of pleas, rants, thank-yous, and apologies that landed in the White House mailroom. In To Obama, Jeanne Marie Laskas interviews President Obama, the letter writers themselves, and the White House staff who sifted through the powerful, moving, and incredibly intimate narrative of America during the Obama years: There is Kelli, who saw her grandfathers finally marry—legally—after thirty-five years together; Bill, a lifelong Republican whose attitude toward immigration reform was transformed when he met a boy escaping MS-13 gang leaders in El Salvador; Heba, a Syrian refugee who wants to forget the day the tanks rolled into her village; Marjorie, who grappled with disturbing feelings of racial bias lurking within her during the George Zimmerman trial; and Vicki, whose family was torn apart by those who voted for Trump and those who did not. They wrote to Obama out of gratitude and desperation, in their darkest times of need, in search of connection. They wrote with anger, fear, and respect. And together, this chorus of voices achieves a kind of beautiful harmony. 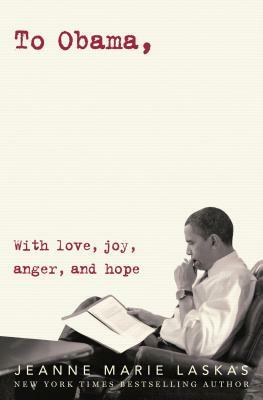 To Obama is an intimate look at one man’s relationship to the American people, and at a time when empathy intersected with politics in the White House. Jeanne Marie Laskas is the author of seven books, including Concussion, Hidden America, and The Exact Same Moon. Her writing has appeared in The New Yorker, GQ, Esquire, The New York Times Magazine, and many other publications. She is a professor at the University of Pittsburgh, where she teaches creative writing, and lives on a farm in Pennsylvania with her husband and two children.